From the intersection of 23rd Street and Constitution Avenue in Washington, D.C., at a corner of the U.S. National Mall near the Potomac River, the grandeur of the Lincoln Memorial is due south, and war-related memorials to Vietnam veterans, World War II, and George Washington, among others, unfold to the left, southeastward. Turning further left, counterclockwise, to look north-northeast from the crossroads, one faces the expanse of the Truman Building, home to the U.S. Department of State, originally built 1939 to 1941. 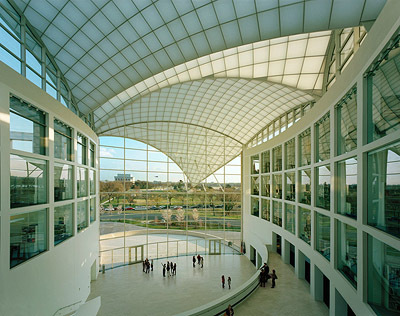 Turning again to the left, to face northwest, one now faces the luminous new headquarters of the U.S. Institute of Peace, with its dramatic, curvaceous roof canopy. 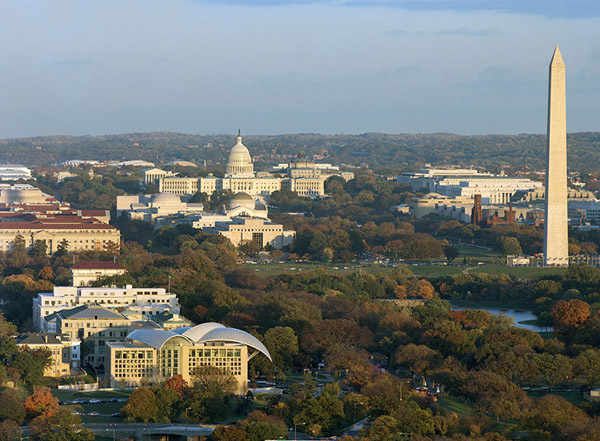 Designed by Moshe Safdie, this new landmark provides the first permanent home for the peace institute, created by the U.S. Congress in 1984 as an independent, nonpartisan center for nonviolent conflict management. In support of the institute's mission, Safdie has created an open, window-intensive layout organized around two soaring, curving, daylit atria. The expression of connection and community among the institute's staff and building visitors is palpable. "I'm not one who believes in overt symbolism, but my sense of a building dedicated to peace was a sense of the lightness of being," said Safdie during a recent press tour of the new institute headquarters. "We worked hard to make the roof translucent and almost weightless. It should be a serene building. It should not be an aggressive building. It should be full of light." 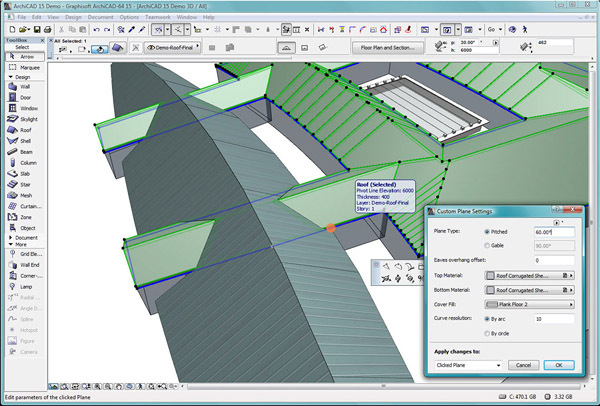 In contrast, the new release of ArchiCAD, a competing BIM application, is focused on one main theme - "design freedom" - and includes new tools and features that greatly expand ArchiCAD's ability to model "freeform" buildings while still retaining the BIM nature of the model. 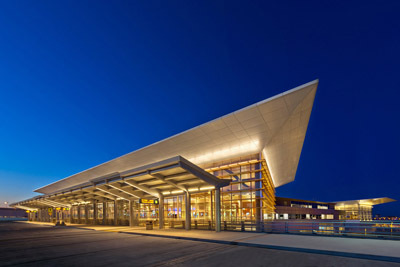 A new terminal has opened at Winnipeg James Armstrong Richardson International Airport in Winnipeg, Manitoba, Canada. 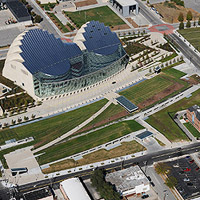 Pelli Clarke Pelli Architects, based in New Haven, Connecticut, designed the building in collaboration with Stantec. The long, low building features extensive glazing, which transmits daylight and allows passengers to see through the facility, across the prairie, and to downtown Winnipeg. The building also features skylights, an atrium, glass boarding bridges, undulating wood ceilings, and wood-paneled walls. LEED certification is targeted. Overall, the building is 25 percent more efficient than Canada's Model National Energy Code for Buildings. In addition to the new terminal, Pelli Clarke Pelli's work included the airport's redevelopment master plan and the design of a parking garage. 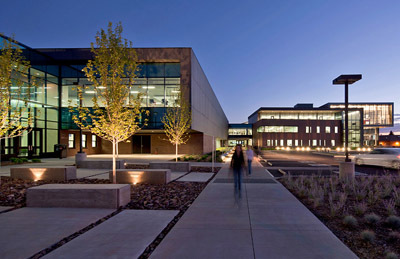 The Health and Learning Center recently opened at Northern Arizona University in Flagstaff, Arizona. Originally conceived as a $34 million expansion project to add health programs to the existing recreation center, the project evolved to include a complete overhaul of Lumberjack Stadium and two floors of classrooms. The architect was the Phoenix office of OWP/P Cannon Design. Find more in our comprehensive visual catalog of architectural products, powered by DesignGuide! "Thanks very much for very good coverage of things architectural." 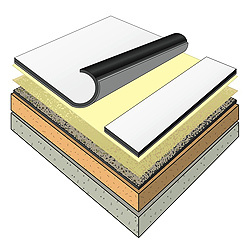 In older buildings with thin-stone anchorage systems using carbon steel shims and anchors, the sealants occasionally fail and the steel can corrode. Which statement correctly explains this? a) The corroded steel is greater in volume than uncorroded steel, and joints inadequate to accommodate this volume increase sometimes fail. b) The corroded steel is lesser in volume than uncorroded steel, and connections become loose due to the volume decrease and sometimes fail. 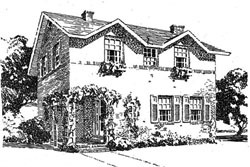 Classic Home 024 — Compact Western-type house by Charles E. White, Jr.
"Here is a fine Western type of house which is suitable for a comparatively small lot. The porch, included in the floor plan, forms an outdoor vestibule for the entrance to the large living room, in which there is a cheerful fireplace. 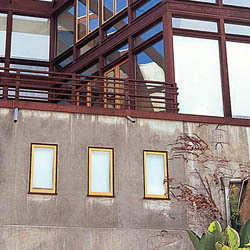 The opening into the dining room might be widened, if desired, to turn almost the entire first floor into one room... "